Retaining the legendary CT-485 design, the CTXL Series comprises state-of-the-art circular chart recorders, available in 3 models— CTXL-TRH, CTXL-DTC, and CTXL-DPR. 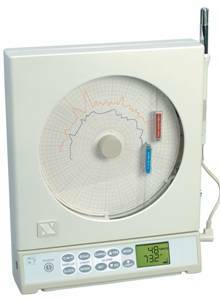 The CTXL-TRH is a temperature/relative humidity chart recorder with a temperature range of -17 to 49ºC (2 to 120ºF) and a humidity range of 2 to 98%. The CTXL-DTC is a dual thermocouple input chart recorder that accepts J, K, or T type thermocouple probes. The CTXL-DPR is a dual-process input chart recorder that accepts 0 to 1 Vdc, 0 to 5 Vdc, 0 to 10 Vdc, 0 to 20 mA, and 4 to 20 mA inputs. All models have dual-display backlit LCDs that show 2 inputs in real time. The charted data is stored in non-volatile memory and can be downloaded to a PC for printout. Functions include audiovisual alarms with built-in relay contacts; real-time clock; monitoring of the minimum, maximum, and average values; 1-, 7-, or 32-day recording; and chart rescaling. The high and low alarm setpoints for the 2 channels are configurable through the front-panel keypad. There are 2 built-in relays for high alarms, and 2 additional voltage outputs power external mechanical relays for low-alarm conditions. Patented features include double sided chart paper and the magnetic hub, and the linear pen and chart drives make it easy to understand the charts. All models come with a stabilizing arm for bench top operation and a decorative foot cover for wall-mount applications. For greater security, a hidden key (white box) enables/disables access to the front keypad. This will prevent unauthorized users from changing the recorder settings.